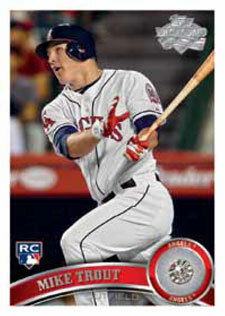 Topps has added 40 players to their Diamond Giveaway checklist. Headlined by high-profile rookies Mike Trout, Eric Hosmer, Michael Pineda and Dustin Ackley, the one-of-one baseball cards all feature a small piece of a real diamond. 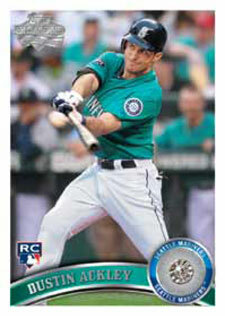 The cards can only be unlocked using codes found in 2011 Topps Baseball Series 1, Series 2 and Update Series. This announcement can be taken a couple of ways. First, there's some strong cards that will make 40 collectors very pleased. However, the late addition of these cards disqualifies the thousands of others who have entered codes throughout the season, particularly with the recent release of 2011 Topps Update Series Baseball. Ultimately, with only 40 total cards added, the chances of getting one are extremely slim to begin with. 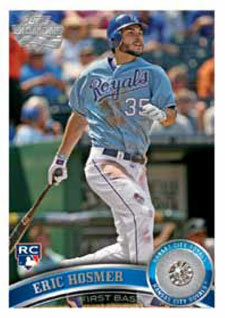 Several of the diamond embedded cards from earlier series have already made their way into collections. Although sellers are asking upwards of $1,500 for big-name superstars, most are just sitting there. As ludicrous as those prices might sound, that's the price that'd been realized for both the Albert Pujols and New York Yankees team card. Other realized prices include Roy Halladay - $950, Ryan Braun - $716.99, Justin Verlander - $512.55, Mark Trumbo - $450 and Felix Hernandez - $380. The newly added cards can be unlocked at any point going forward. 2011 Topps Update DUSTIN ACKLEY DIAMOND ANNIVERSARY REAL DIAMOND #1 1 BGS 9.0! !